An object launched into the air (without power itself) is considered a projectile. A projectile motion is parabolic. This includes golf balls, batting baseballs, kicking footballs, shooting basketballs, shooting bullets, or jumping off a cliff. 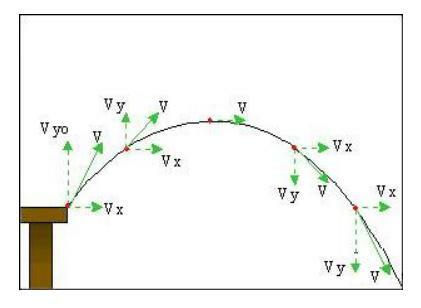 A projectile motion just as discussed earlier includes 2 components, vertical and horizontal. Therefore it takes place in two dimensions. Often times air resistance is important but its effects can be ignored. And the vertical component in most cases is the acceleration of gravity. Therefore, the general kinematics equations can be used in the calculations.